This Proctor's is not Proctors. The news today that the Rensselaer County Regional Chamber of Commerce is moving into office space in the building that includes the long-vacant Proctor's Theater in downtown Troy got us thinking about places, names, things that often get misspelled or mixed up in the Capital Region. You know, like how Proctors (no apostrophe) is the place in Schenectady, but the theater in Troy is Proctor's (with an apostrophe). So we put together a list, and asked people on Twitter and Facebook for suggestions. Here's what we came up with. And there are no doubt a bunch more, so if you have some mind, please suggest them in the comments. Just a note before we start: We have definitely made many of these flubs on AOA. We're not trying to throw any rocks from inside a glass house. Ballston/Ballston Spa - Ballston is a town the southwestern part of Saratoga County. Ballston Spa is a village in Saratoga County -- part of it is in the town of Ballston, and part of it is in the town of Milton. Bennington - The town in Vermont just over the border with New York is spelled with a double "n" in the middle. Bonus: The village of Scotia (sko-sha) is in the town of Glenville. Greenfield/Greenwich - Greenfield is a town in Saratoga County, to the northwest of Saratoga Springs. Greenwich is both a town and a village in Washington County, the county to the east of Saratoga County. And Greenwich isn't pronounced like the places in Connecticut or England -- it's "green-witch." Lansingburgh - Troy's northernmost section includes an "h" on the "burg." Petersburgh/Petersburg - Petersburgh -- with an "h," the town in Rensselaer County -- includes a hamlet that the USPS apparently likes to spell Petersburg (no "h"). Princetown - That town in the middle of Schenectady County is Princetown -- with a "w."
@alloveralbany Pronunciation of Cairo and Rensselaer - "ren-suh-leer" and "ren-suh-ler" to give two examples. Don't forget "ren-slur" MT @MMR_MattRyan: @alloveralbany Pronunciation of Cairo and Rensselaer - "ren-suh-leer" and "ren-suh-ler"
@lunchboxbrain @alloveralbany I had a woman tell me once she was from "Rent-ler"
Rensselaer/Rensselaerville Rensselaer is the city in Rensselaer County across the Hudson River from Albany. Rensselaerville is the town in the southwest corner of Albany County -- not Rensselaer County. Schaghticoke - It's both a town and a village in northwest Rensselaer County. Often pops up in reference to its fair, said to be the third oldest in New York State. @alloveralbany We heard some awful attempts at "Schenectady". Some folks we deal with in the south really have trouble with that one. Voorheesville - The village in the town of New Scotland in Albany County spells its name with a double "o" and a double "e" the middle. Baumgartner As in Matt Baumgartner, the local entrepreneur, is spelled with a "t," not a "d."
The Breslins - Neil Breslin = state Senator representing a district that includes Albany. Mike Breslin = former Albany County executive. Thomas Breslin = state Supreme Court judge. The Cornings - Erastus Corning II was Albany mayor from 1942 to 1983. His great grandfather -- Erastus Corning I -- was mayor during the 1830s (among other things). Morse/Morris Shawn Morse is chairman of the Albany County. Shawn Morris is the former city of Albany Common Council president. Paterson - David Paterson, the former New York governor spells his name with only one "t."
Tedisco/Tedesco - Jim Tedisco = longtime state Assembly member whose district now includes parts of Schenectady and Saratoga counties. John Tedesco = Troy police chief. Bombers - The name of the burrito bars doesn't include an apostrophe. The Confectionery The establishment in downtown Troy is spelled with an "e" toward the end. The Kosciusko Bridge/The Twin Bridges - The bridges that carry the Northway (I-87) over the Mohawk River between Albany and Saratoga counties are officially called The Thaddeus Kosciusko Bridge (named after the Revolutionary War engineer). But most people call them "The Twin Bridges" or "The Twins." The Palace The big theater in downtown Albany is technically the Palace Theatre -- with an "re" at the end. The Saratoga Race Course - A lot of people simply call it "The Track." But its official name is the Saratoga Race Course. Not the Saratoga Racecourse. Not the Saratoga Race Track. Bonus: That horse racing track in Queens, also run by NYRA, is the Aqueduct Racetrack -- with an "e" in the middle, not an "a." Furthermore: Here's a Capital Region name pronunciation guide put together by a guy named Gregory Tryson. If you pronounce it "Ren su leeer", you're not from "here". I grew up in Watervliet. When I went off to college, people read it as Water-Vlee-Et. All of this said, we have nothing on some of the place names in Massachusetts. In Albany there are two little streets off New Scotland named for Southwest Indians -- Zuni and Hopi Streets. When I moved there 7 years ago I found that almost everyone in that neighborhood pronounced them Zoon-eye (not Zoon-ee) and Hop-eye (not Hope-ee). Makes me nuts and I cannot bring myself to (mis)pronounce those tribal names even if it's local custom. Any time I hear a radio commercial that was not produced in the Capital Region, I can immediately determine that they don't know how to pronounce our fair city's name. It's not EL-bunnie, it's not ULL-bunnie, it's not al-BAYNEE, you tourists. Coeymans is pronounced "Kwee-mins" not "Coy-mans," or am I misunderstanding what you have written? You mean I've been pronouncing Coeymans wrong all these years? I have always heard and said "KWEE-munz", not "Coy-mens". This. THIS. This is why I come to this site. I've now learned more in the three minutes it took me to read this post than nearly sixteen years of living here. I will be back to this page many, many times. A few of my local place name bugaboos; Albany -- letter A should sound like the letter A in 'awl' not 'bad', Altamont (reverse what I said about Albany), and Lathams (is there more than one). Coymans is pronounced Kweemans, as noted in the Tryson link in your post. Newcomers have changed Greenwich CT to "Grennitch," but the earlier established families still call it "Green-witch" as in Greenwich NY. Latham was the name of the family that lived and farmed at Latham's Corners, now Latham Circle. Proctor's in Schenectady is indeed Proctor's on the marquee. This Proctor's is not Proctors either. @A.C., John, others: Yep, the Coeymans section was bungled. It's been updated/corrected. I'd really like a consensus on one of these: how does one properly pronounce the city of Rensselaer? Remember a number of years ago McDonald's had locally themed commercials? That's how I learned to pronounce Kosciusko. Hudson and Hudson Falls are totally different places. Shortly after moving here I got lost and ended up in Schaghticoke but when I found my way back I couldn't tell anyone where I'd been because I had no idea how to pronounce what I saw on the sign. Interestingly enough I got the hang of the harder names first (Schaghticoke, Schenectady, the fact that Rensselaer the city and Rensselaer the county are usually pronounced differently), but three years after I moved here people still give me grief if I pronounce Colonie as "Colony." It's a very minor stress on the last syllable, but I've found that if I say it like "Colony," people look at me as if I've just spoken a sentence in Chinese. Ren-sse-ler is how residents like the city pronounced, and Rensseleer is the way the College likes itself to be called (as opposed to RPI, which folks from the region still embrace). Don't forget that Albany is pronounced in three different ways, depending on whether or not the individual is a native of the city or area. There is "AWW"-buny, a pronunciation from generations prior. Notable speakers with such an accent include former Mayor Jerry Jennings. And then there is "ALL-bany," spoken by many people who moved to the area and newer generations. And finally, "AL-bany," spoken by those who have never heard of this place. I had a friend who said she lived in VALE-A-TIE - rather than Va-lay-sha - I let her pronounce it that way for months without correcting her because it was so cute. USPS will definitely deliver mail addressed to Sch'dy and 90% sure to Sch'coke with the proper zip. Had to hand address many many letters in my time. The Greene County town of Cairo is pronounced Kay-Row, not Kai-row. You can always tell whether someone is a Green County native based on what they call that town. There are certain towns around here when I cringe at the "correct" pronunciation, such as Cairo, Greenwich, etc. Saying them the "correct" way make one sound like some uneducated yokel. I wonder why these particular names were chosen if they didn't know how to say them correctly? Regarding Capital/Capitol- this one drives me nuts also, especially when I see a business named Capitol District____. Let's not forget that it is The College of Saint Rose...not St. Rose College! Mechanicville - It's Mechanic Ville not Mechanics Ville, as alot of people pronounce it. An entry from the Department of Redundancy Department: It's the NYS Education Department. Not the NYS Department of Education. And not the NYS Department of Education Department. 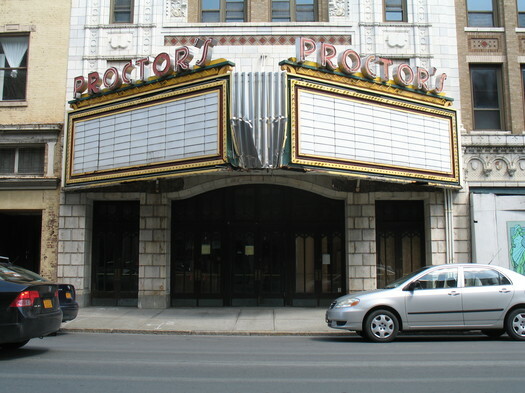 RE: Proctors - the Schenectady Proctors indeed does NOT have an apostrophe in its name, though it did when it actually belonged to Mr. Proctor. The apostrophe in question moved nearby, hence the name of the Apostrophe Cafe. But the confusion comes from the marquee, which retains the original apostrophe. The Proctors marquee, btw, is not original, it was fabricated in 1980 to replace an anachronistic 1940's marquee that was in rough shape. The Twin Bridges were also nicknamed the Dolly Parton Bridges. I had a client whose tongue always tripped over the name "Niskayuna." And I thought THAT was an easy one! Another one to add to your list: Cohoes. It's Cuh-HOSE, not "CO-hose." @Justin: Proctor's chooses to use an apostrophe on its marquee but wants you to pretend it isn't there? I am calling shenanigans. It's already been mentioned, but you can tell when a commercial has been produced by someone from out of the area by how they pronounce Colonie. I was filing a car insurance claim over the phone quite a few years ago and the person on the other end recommended a body shop in "Water-vuh-lay". I played dumb and pretended I didn't hear her: "I'm sorry, did you say Waterford or Watervliet?" "Oh, it's pronounced Water-vuh-leet? Okay, sorry about that!" I think their call center was in Scranton. I'm surprised no one has mentioned Coxsackie yet. I still have trouble with that one. You pronounce the Cox like Coke, right? Or is it "cuck"? Trusted Commenter's note about Latham Circle formerly being called Latham's Corners probably explains why my grandmother -- and most people that age, if they're even still around -- used to add the S when referring to that area. Due to the proper pronounciation of our capital city, I got Alton Brown's name wrong for many years. He says it "AL-ton". This one has nothing to do with local place names, but as a small child I once told a teacher my parents went to Cuba. I wasn't old enough to know about or comprehend the embargo, so I didn't understand why I got a confused/shocked look in return. I think a call home ensued before the matter was cleared up; in my defense, I had no idea how to pronounce Quebec and I thought the C was silent. It has been too long, but Shushan has two pronunciations, with one being the preferred. Pownel in Vermont is supposed to be as close to one syllable as possible. To the question of how to properly pronounce Rensselaer, adjacent to which I have lived for a couple of decades: you can make it two syllables or three, you can add a 't', but you may not under any circumstances pronounce it to rhyme with "ear." That said, we could solve the problem (and many others) by having Albany annex it and return it to its previous name of East Albany. I don't know if this is still the case, but Blooming Grove Drive in Troy was labeled "Blooming Grove" on one end and "Bloomingrove" on the other. Also, again, don't know if this is still the case, but Google Maps used to insist that Vly Road was actually Valley Road. I'm told that al-BENNY is in Georgia, and AL (as in Bundy)-bany is in Oregon. Coxsackie is one that you don't hear often but do hear so many ways. Seems that the accepted pronunciation is something like cooks-ZOCK-ee. @ D: as I said, Proctors used to use the apostrophe. But the marquee wasn't changed when the name was. Hence the confusion. There's no apostrophe on anything except marquee. I've lived here all my life and still don't understand the Rensselaer pronunciation. Ren-suh-ler for the city and county, and Ren-suh-LEER for the school? Or is it just that everyone I have ever met that went to or worked at the school is perpetuating the myth that the school should be pronounced differently? To add to the Tedesco fun - that word is the Italian for German.